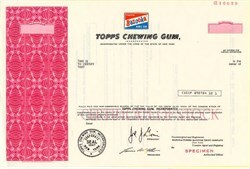 Beautiful engraved RARE specimen certificate from the Topps Chewing Gum Company printed in 1978. This historic document was printed by Security-Columbian Banknote Company and has an ornate border around it with a vignette of the company's logo, a pack of Bazooka Gum. This item has the printed signatures of the Company's President, Joel Shorin and and is over 29 years old. The Topps Company, Inc. (NASDAQ: TOPP) is a publicly traded company based in New York City that manufactures candy and collectibles. It is best known as a leading producer of baseball cards and other sports-related trading cards. American Leaf Tobacco encountered difficulties as World War I cut off Turkish supplies of tobacco to the United States, and later as a result of the Great Depression. Shorin's sons, Abram, Ira, Philip, and Joseph, decided to focus on a new product but take advantage of the company's existing distribution channels. To do this, they relaunched the company as Topps, with the name meant to indicate that it would be "tops" in its field. The chosen field was the manufacture of chewing gum, selected after going into the produce business was considered and rejected. At the time, chewing gum was still a relative novelty sold in individual pieces. Topps's most successful early product was Bazooka bubblegum, which was packaged with a small comic on the wrapper. Starting in 1950, the company decided to try increasing gum sales by packaging them together with trading cards featuring Western character Hopalong Cassidy (William Boyd) at the time Boyd, as one of the biggest stars of early television, was featured in newspaper articles and on magazine covers, along with a wave of Hopalong merchandising. When Topps next introduced baseball cards as a product, the cards immediately became its primary emphasis. The company began its existence as Topps Chewing Gum, Inc., a partnership between the four Shorin brothers. It later incorporated under New York law in 1947. The entire company originally operated out of Brooklyn, but production facilities were moved to a plant in Duryea, Pennsylvania in 1965. Corporate offices remained at 254 36th Street in New York, a location in the Brooklyn waterfront district by the Gowanus Expressway. In 1994, the headquarters relocated to One Whitehall Street in lower Manhattan. After being privately held for several decades, Topps offered stock to the public for the first time in 1972 with the assistance of investment banking firm White, Weld & Co. The company returned to private ownership when it was acquired in a leveraged buyout led by Forstmann Little & Company in 1984. The new ownership group again made Topps into a publicly traded company in 1987, now renamed to The Topps Company, Inc. In this incarnation, the company was incorporated in Delaware for legal purposes, but company headquarters remained in New York. Management was left in the hands of the Shorin family throughout all of these maneuverings. Criticism of the company's financial performance and flat stock price led two hedge funds holding 7.4% of the stock to launch a proxy fight in July 2006. Calling for better management of the company as the Topps Full Value Committee, they tried to place three members on the company's board of directors at the annual shareholder meeting. In 1951, Topps produced its first baseball cards in two different sets known today as Red Backs and Blue Backs. Each set contained 52 cards, like a deck of playing cards, and in fact the cards could be used to play a game that would simulate the events of a baseball game. Also like playing cards, the cards had rounded corners and were blank on one side, which was colored either red or blue (hence the names given to these sets). The other side featured the portrait of a player within a baseball diamond in the center, and in opposite corners a picture of a baseball together with the event for that card, such as "fly out" or "single". Topps changed its approach in 1952, this time creating a much larger (407 total) set of baseball cards and packaging them with its signature product, bubblegum. The company also decided that its playing card model was too small (2 inches by 2-5/8 inches) and changed the dimensions to 2-5/8 inches by 3-5/8 inches with square corners. (In 1957, Topps shrank the dimensions of its cards slightly, to 2-1/2 inches by 3-1/2 inches, setting a standard that remains the basic format for most sports cards produced in the United States.) The cards now had a color portrait on one side, with statistical and biographical information on the other. This set became a landmark in the baseball card industry, and today the company considers this its first true baseball card set. The cards were released in several series over the course of the baseball season, a practice Topps would continue with its baseball cards until 1974. However, the later series did not sell as well, as the baseball season wore on and popular attention began to turn towards football. Topps was left with a substantial amount of surplus stock in 1952, which it largely disposed of by dumping many cards into the Atlantic. In later years, Topps either printed series in smaller quantities late in the season or destroyed excess cards. As a result, cards with higher numbers from this period are rarer than low numbers in the same set, and collectors will pay significantly higher prices for them. The last series in 1952 started with card #311, which is Topps' first card of Mickey Mantle and remains the most valuable Topps card ever (and the most valuable post-1948 card). The 1952 Topps Mantle is often mistakenly referred to as Mickey's rookie card, but that honor belongs to his 1951 Bowman card (which is worth about a third of the 1952 Topps card). The combination of baseball cards and bubblegum was popular among young boys, and given the mediocre quality of the gum, the cards quickly became the primary attraction. In fact, the gum eventually became a hindrance because it tended to stain the cards, thus impairing their value to collectors who wanted to keep them in pristine condition. It was finally dropped from baseball card packs in 1992. During this period, baseball card manufacturers generally obtained the rights to depict players on merchandise by signing individual players to contracts for the purpose. Topps first became active in this process through an agent called Players Enterprises in July 1950, in preparation for its first 1951 set. The later acquisition of rights to additional players allowed Topps to release its second series. This promptly brought Topps into furious competition with Bowman Gum, another company producing baseball cards. Bowman had become the primary maker of baseball cards and driven out several competitors by signing its players to exclusive contracts. The language of these contracts focused particularly on the rights to sell cards with chewing gum, which had already been established in the 1930s as a popular product to pair with baseball cards. To avoid the language of Bowman's existing contracts, Topps sold its 1951 cards with caramel candy instead of gum. However, because Bowman had signed many players in 1950 to contracts for that year, plus a renewal option for one year, Topps included in its own contracts the rights to sell cards with gum starting in 1952 (as it ultimately did). Topps also tried to establish exclusive rights through its contracts by having players agree not to grant similar rights to others, or renew existing contracts except where specifically noted in the contract. Bowman responded by adding chewing gum "or confections" to the exclusivity language of its 1951 contracts, and also sued Topps in U.S. federal court. The lawsuit alleged infringement on Bowman's trademarks, unfair competition, and contractual interference. The court rejected Bowman's attempt to claim a trademark on the word "baseball" in connection with the sale of gum, and disposed of the unfair competition claim because Topps had made no attempt to pass its cards off as being made by Bowman. The contract issue proved more difficult because it turned on the dates when a given player signed contracts with each company, and whether the player's contract with one company had an exception for his contract with the other. As the contract situation was sorted out, several Topps sets during these years had a few "missing" cards, where the numbering of the set skips several numbers because they had been assigned to players whose cards could not legally be distributed. The competition, both for consumer attention and player contracts, continued until 1956, when Topps bought out Bowman. This left Topps as the dominant producer of baseball cards for a number of years. The next company to challenge Topps was Fleer, another gum manufacturer. Fleer signed star Ted Williams to an exclusive contract in 1959 and sold a set of cards oriented around him. Williams retired the next year, so Fleer began adding around him other mostly retired players in a Baseball Greats series, which was sold with gum. Two of these sets were produced before Fleer finally tried a 67-card set of currently active players in 1963. However, Topps held onto the rights of most players and the set was not particularly successful. Stymied, Fleer turned its efforts to supporting an administrative complaint filed by the Federal Trade Commission, alleging that Topps was engaging in unfair competition through its aggregation of exclusive contracts. A hearing examiner ruled against Topps in 1965, but the Commission reversed this decision on appeal. The Commission concluded that because the contracts only covered the sale of cards with gum, competition was still possible by selling cards with other small, low-cost products. However, Fleer chose not to pursue such options and instead sold its remaining player contracts to Topps for $395,000 in 1966. The decision gave Topps an effective monopoly of the baseball card market. That same year, however, Topps faced an attempt to undermine its position from the nascent players' union, the Major League Baseball Players Association. Struggling to raise funds, the MLBPA discovered that it could generate significant income by pooling the publicity rights of its members and offering companies a group license to use their images on various products. After initially putting players on Coca-Cola bottlecaps, the union concluded that the Topps contracts did not pay players adequately for their rights. MLBPA executive director Marvin Miller then approached Joel Shorin, the president of Topps, about renegotiating these contracts. At this time, Topps had every major league player under contract, generally for five years plus renewal options, so Shorin declined. After continued discussions went nowhere, the union before the 1968 season asked its members to stop signing renewals on these contracts, and offered Fleer the exclusive rights to market cards of most players (with gum) starting in 1973. Although Fleer declined the proposal, by the end of the year Topps had agreed to double its payments to each player from $125 to $250, and also to begin paying players a percentage of Topps's overall sales. The figure for individual player contracts has since increased to $500. As a byproduct of this history, Topps continues to use individual player contracts as the basis for its baseball card sets today. This contrasts with other manufacturers, who all obtain group licenses from the MLBPA. The difference has occasionally affected whether specific players are included in particular sets. Players who decline to sign individual contracts will not have Topps cards even when the group licensing system allows other manufacturers to produce cards of the player, as happened with Alex Rodriguez early in his career. On the other hand, if a player opts out of group licensing, as Barry Bonds did in 2004, then manufacturers who depend on the MLBPA system will have no way of including him. Topps, however, can negotiate individually and was belatedly able to create a 2004 card of Bonds. In addition, Topps is the only manufacturer able to produce cards of players who worked as replacement players during the 1994 baseball strike, since they are barred from union membership and participation in the group licensing program. A semblance of competition returned to the baseball card market in the 1970s when Kellogg's began producing "3-D" cards and inserting them in boxes of breakfast cereal (originally Corn Flakes, later Raisin Bran and other brands). The Kellogg's sets contained fewer cards than Topps sets, and the cards served as an incentive to buy the cereal rather than being the intended focus of the purchase, as tended to be the case for cards distributed with smaller items like candy or gum. Topps appears not to have considered the Kellogg's cards a threat and took no action to stop them. The Topps monopoly on baseball cards was finally broken by a lawsuit that let Fleer and another company, Donruss, enter the market in 1981. Fleer and Donruss began making large, widely distributed sets to compete directly with Topps, packaged with gum. When the ruling was overturned on appeal in August of 1981, Topps appeared to have regained its monopoly, but both of its competitors instead began packaging their cards with other baseball items--logo stickers from Fleer, and cardboard puzzle pieces from Donruss. Other manufacturers later followed, but Topps remains one of the leading brands in the baseball card hobby. In response to the competition, Topps began regularly issuing additional "Traded" sets featuring players who had changed teams since the main set was issued, following up on an idea it had experimented with a few years earlier. While "Traded" or "Update" sets were originally conceived to deal with players who changed teams, they became increasingly important for another reason. In order to fill out a 132-card set (the number of cards that fit on a single sheet of the uncut cardboard used in the production process), it would contain a number of rookie players who had just reached the major leagues and not previously appeared on a card. Since a "rookie card" is typically the most valuable for any given player, the companies now competed to be the first to produce a card of players who might be future stars. Increasingly, they also included highly touted minor league players who had yet to play in the major leagues. For example, Topps obtained a license to produce cards featuring the U.S. Olympic baseball team and thus produced the first card of Mark McGwire, one that would become quite valuable to collectors. This card from the 1984 squad appeared in Topps's regular 1985 set, but by the next Olympic cycle the team's cards had been migrated to the "Traded" set. As a further step in this race, Topps resurrected its former competitor Bowman as a subsidiary brand in 1989, with Bowman sets similarly chosen to include a lot of young players with bright prospects. Also beginning in 1989 with the entry of Upper Deck into the market, card companies began to develop higher-end cards using improved technology. Following Topps's example, other manufacturers now began to diversify their product lines into different sets, each catering to a different niche of the market. The initial Topps effort at producing a premium line of cards, in 1991, was called Stadium Club. Topps continued adding more sets and trying to distinguish them from each other, as did its competitors. The resulting glut of different baseball sets caused the MLBPA to take drastic measures as the market for them deteriorated. The union announced that for 2006, licenses would only be granted to Topps and Upper Deck, the number of different products would be limited, and players would not appear on cards before reaching the major leagues. Although most of its products were distributed through retail stores and hobby shops, Topps also attempted to establish itself online, where a significant secondary market for sports cards was developing. Working in partnership with eBay, Topps launched a new brand of sports cards called etopps in December 2000. These cards are sold exclusively online through individual "IPOs" in which the card is offered for a week at the IPO price. The quantity sold depends on how many people offer to buy, but is limited to a certain maximum. After a sale, the cards are held in a climate-controlled warehouse unless the buyer requests delivery, and the cards can be traded online without changing hands except in the virtual sense. Topps also acquired ThePit.com, a startup company that earlier in 2000 had launched a site for online stock-market style card trading. The purchase was for $5.7 million cash in August 2001 after Topps had earlier committed to invest in a round of venture capital financing for the company. This undertaking was not very successful, however, and Topps unloaded the site on Naxcom in January 2006. The amount of the transaction was not disclosed, but Topps charged a $3.7 million after-tax loss on its books in connection with the sale. Although Topps did not invent the concept of baseball cards, its dominance in the field basically allowed the company to define people's expectations of what a baseball card would look like. In addition to establishing a standard size, Topps developed various design elements that are considered typical of baseball cards. Some of these were the company's own innovations, while some were ideas borrowed from others that Topps helped popularize. One of the features that contributed significantly to Topps's success beginning with the 1952 set was providing player statistics. At the time, complete and reliable baseball statistics for all players were not widely available, so Topps actually compiled the information itself from published box scores. While baseball cards themselves had been around for years, including statistics was a relative novelty that fascinated many collectors. Those who played with baseball cards could study the numbers and use them as the basis for comparing players, trading cards with friends, or playing imaginary baseball games. It also had some pedagogical benefit by encouraging youngsters to take an interest in the underlying math. The cards originally had one line for statistics from the most recent year (i.e. the 1951 season for cards in the 1952 set) and another with the player's lifetime totals. Bowman promptly imitated this by putting statistics on its own cards where it had previously only had biographical information. For the first time in 1957, Topps put full year-by-year statistics for the player's entire career on the back of the card. Over the next few years, Topps alternated between this format and merely showing the past season plus career totals. The practice of showing complete career statistics became permanent in 1963, except for one year, 1971, when Topps sacrificed the full statistics in order to put a player photo on the back of the card as well. Although the 1971 set was an aborted experiment in terms of putting photos on card backs, that year was also a landmark in terms of baseball card photography, as Topps for the first time included cards showing color photographs from actual games. The cards themselves had been in color from the beginning, though for the first few years this was done by using artist's portraits of players rather than actual photographs. After starting out with simple portraits, in 1954 Topps put two pictures on the front of the card--a hand-tinted 'color' close-up photo of the player's head, and the other a black-and-white full-length pose. The same basic format was used in 1955, this time with the full-length photo also hand-tinted. For 1956, the close-up tinted photo was placed against a tinted full-background 'game-action' photo of the player. The close-up head shots of some individual players were reused each year. From 1957 on, virtually all cards were posed photographs, either as a head shot or together with a typical piece of equipment like a bat or glove. If using such a prop, the player might pose in a position as if he were in the act of batting, pitching, or fielding. Photographs did not appear in sharp focus and natural color until 1962. However, that year also saw problems with the print quality in the second series, which lacked the right proportion of ink and thus gave the photographs a distinctly greenish tint. The affected series of cards was then reprinted, and several players were actually shown in different poses in the reprinting. Although Topps had produced error cards and variations before, this was its largest single production glitch. In the absence of full-color action photography, Topps still occasionally used artwork to depict action on a handful of cards. Starting in 1960 a few cards showed true game action, but the photographs were either in black-and-white or hand-tinted color. These cards were primarily highlights from the World Series (in addition to basic cards of individual players, Topps sets commonly include cards for special themes�the 1974 tribute to Hank Aaron as he was about to break Babe Ruth's career home run record is one example). The 1972 set finally included color photographs, which were used for special "In Action" cards of selected star players. Thereafter, Topps began simply mixing game photography with posed shots in its sets. When used for the cards of individual players, some of the early action photography had awkward results. The photos were sometimes out of focus or included several players, making it difficult to pick out the player who was supposed to be featured on the card. In a few cases, a misidentification meant that the player didn't even appear in the picture. These problems diminished as Topps's selection of photographs gradually improved. Before statistics, biographical information, and commentary became the dominant element on the backs of cards, Topps also featured artwork there. This primarily involved using various types of cartoons drawn by its stable of artists. These appeared on card backs as late as 1982, but gradually declined in the prominence of their placement and the proportion of cards on which they appeared. In 1993, Topps finally managed again to incorporate a player photo on the back as well as the front of the card, after some competitors had been doing so for a number of years. 1974 Topps baseball cards showing the "Washington Nat'l League" mistake and the correct San Diego Padres version.The pictures and information on baseball cards sold during one season came primarily from earlier seasons, so Topps used various tactics to give its cards a greater sense of staying current with the times. Before coming up with the idea of a "Traded" set, the company still tried to produce cards of players with their new team if they changed teams in the offseason. This was sometimes accomplished by showing the player without any team cap, or by airbrushing out elements of the former team's logo on his uniform. Cards for rookies could also be prepared by airbrushing over their minor-league uniforms in photos. In one case, Topps even got too far in front of events, as in 1974 it showed a number of players as being with the "Washington Nat'l Lea." franchise, due to expectations that the San Diego Padres would relocate to the vacant Washington, D.C. market. The team designation was the only change, as no new nickname for the franchise had been selected. When the move failed to materialize, Topps had to replace these with cards showing the players still as Padres. On rare occasions, Topps has issued special cards for players who had either died or had been injured. The 1959 set had card 550 as "Symbol Of Courage - Roy Campanella", with a color photo of the paralyzed former Dodger in his wheelchair and a black-and-white photo of him in uniform inserted to the upper left. The 1964 set issued cards for two recently deceased players: Ken Hubbs of the Cubs with a different "In Memoriam" front design compared to standard cards, and Colts pitcher Jim Umbricht's regular card with a special note on the back about his April 1964 death from cancer. In October 2006, Topps was prepping for its annual updated/traded card release, which featured Cory Lidle in a Yankees uniform. After Lidle's tragic death, the cards were pulled and subsequently released with "In Memoriam" on its front. In addition to baseball, Topps also produced cards for American football in 1951, which are known as the Magic set. For football cards Bowman dominated the field, and Topps did not try again until 1955, when it released an All-American set with a mix of active players and retired stars. After buying out Bowman, Topps took over the market the following year. Since then, Topps has sold football cards every season. However, the emergence of the American Football League in 1960 to compete with the established National Football League also allowed Topps's competitors, beginning with Fleer, to make inroads. Fleer produced a set for the AFL in 1960, then featured both leagues for one year before focusing on the AFL again. Philadelphia Gum then secured the NFL rights for 1964, forcing Topps to go for the AFL and leaving Fleer with no product in either baseball or football. Although more competitive for a time, the football card market was never as lucrative, so the other companies did not fight as hard over it. After the AFL-NFL Merger was agreed to, Topps became the only major football card manufacturer beginning in 1968. In spite of the lack of competition, or perhaps to preempt it, Topps also created two sets of cards for the short-lived United States Football League in the 1980s. Many NFL legends had their first ever cards produced in the USFL sets. These players include Steve Young, Jim Kelly, and Reggie White. This resulted in a controversy when these players debuted in the NFL. Many wondered if the USFL cards should be considered rookie cards because the league did not exist anymore. The situation continued until growth in the sports card market generally prompted two new companies, Pro Set and Score, to start making football cards in 1989. Topps also makes cards for other major American professional sports. After football, its next venture was into ice hockey, with a 1954 set featuring players from the four National Hockey League franchises located in the U.S. at the time (Boston Bruins, Chicago Blackhawks, Detroit Red Wings, and New York Rangers). Topps did not make a serious effort to take on Parkhurst Products, the leading Canadian hockey card manufacturer, for a couple more years. After Parkhurst disappeared from the market in the 1960s, Topps then reached an agreement with O-Pee-Chee, another Canadian company, to jointly produce hockey cards. O-Pee-Chee had already obtained a license to print Topps baseball cards for the Canadian market, and for a number of years the two companies would produce often-identical cards for both sports, but each under its own brand for its respective market. It was not uncommon that O-Pee-Chee would have a card set with 264 cards or 396 cards but Topps would have much smaller sets. Topps then acquired the rights to use the O-Pee-Chee name on sports cards after that company was sold to Nestl�. However, anticipating the 2004-05 NHL lockout, Topps allowed its license for hockey to expire after the 2003-04 season. This ultimately left the sport to Upper Deck, which emerged as the sole licensee when the league resumed play. Topps first sold cards for basketball in 1957, but stopped after one season. It started again in 1969 and continued until 1982, then abandoned the market for another decade. Topps finally returned to basketball cards in 1992, several years after its competitors. This would be perfect timing because 1992 was the rookie year of Shaquille O'Neal. In a more recent addition to its lineup, Topps began producing cards for soccer in 1996, in partnership with Major League Soccer. Topps Comics The X-Files #5 (May 1995), cover art by Miriam Kim.Originally, Topps was purely a gum company, and its first product was simply called "Topps gum". Other gum and candy products followed. In imitation of Bowman and other competitors, Topps eventually also began producing trading cards and other collectibles for a variety of topics unrelated to sports. More recently, the company has tried its hand at developing comic books and games. The longest-lived Topps product line remains Bazooka bubblegum, small pieces of gum in patriotic red, white, and blue packaging. Bazooka was introduced in 1947 as a bar of gum that sold for five cents. Unlike the gum sold with baseball cards, it was of better quality and capable of selling on its own merit. In 1953, Topps began selling smaller penny pieces with the Bazooka Joe comic strip on the wrapper as an added attraction. One of the highlights of Bazooka Joe was a wad of Bazooka gum chewed by Arizona Diamondbacks outfielder Luis Gonzalez which actually sold at auction in the year 2001. Ironically, this was the same year that the Arizona Diamondbacks would win the World Series. This event was featured on a Bazooka Joe comic strip months later. Even though baseball cards became the company's primary focus during this period, Topps still developed a variety of candy items. For quite a few years, the company stuck within familiar confines, and virtually all of these products involved gum in some way. Sales declined significantly in the 1970s, however, when this relatively hard gum was challenged by Bubble Yum, a new, softer form of bubblegum from Lifesavers. In recent years, Topps has added more candy items without gum. One particular focus has been lollipops, such as Ring Pops. However, Topps has complained that increasing public attention to childhood nutrition undercuts its candy sales. Under pressure by shareholders, the company considered selling off its confectionery business in 2005, but was unable to find a buyer to meet its price and decided to cut management expenses instead. As its sports products relied more on photography, Topps redirected its artistic efforts toward editorial trading cards, also called nonsport trading cards, on themes inspired by popular culture. For example, the Space Race prompted a set of "Space Cards" in 1958. Topps has continued to create collectible cards and stickers on a variety of subjects, often targeting the same adolescent male audience as its baseball cards. In particular, these have covered movies, television series, and other cultural phenomena ranging from The Beatles to the life story of John F. Kennedy. The many Star Wars card series have done well, with a few exceptions. Many Topps artists came from the world of comics and continued to work in that field as well. The shift from sports to other topics better suited the creative instincts of the artists and coincided with turmoil in the comic book industry over regulation by the Comics Code Authority. Beginning at Topps when he was a teenager, Art Spiegelman was the company's main staff cartoonist for more 20 years. Other staffers in Topps' Product Development Department at various times included Larry Riley, Mark Newgarden, Bhob Stewart and Rick Varesi. Topps' creative directors of Product Development, Woody Gelman and Len Brown, gave freelance assignments to leading comic book illustrators, such as Jack Davis, Wally Wood and Bob Powell. Spiegelman, Gelman and Brown also hired freelance artists from the underground comix movement, including Bill Griffith and Kim Deitch and Robert Crumb. Jay Lynch  did extensive cartooning for Topps over several decades. Drawing on their previous work, these artists were adept at things like mixing humor and horror, as with the Funny Monsters cards in 1959. The 1962 Mars Attacks cards, sketched by Wood and Powell and painted by Norman Saunders, later inspired a Tim Burton movie. A tie-in with the Mars Attacks film led to a 1994 card series, a new 100-card "archives" set reprinting the 55 original cards, plus 45 new cards from several different artists, including Norm Saunders' daughter, Zina Saunders. Among Topps's most notable achievements in the area of satire and parody have been Wacky Packages, a takeoff on various household consumer products, and Garbage Pail Kids, a parody of the Cabbage Patch Kids dolls. Another popular series was the Civil War set, also with Norman Saunders' artwork. Although baseball cards have been Topps's most consistently profitable item, certain fads have occasionally produced spikes in popularity for non-sports items. For a period beginning in 1973, the Wacky Packages stickers managed to outsell Topps baseball cards, becoming the first product to do so since the company's early days as purely a gum and candy maker. Pok�mon cards would accomplish the same feat for a few years starting in 1999. In the absence of new fads to capitalize on, Topps has come under pressure from stock analysts, since its sports card business is more stable and has less growth potential. Drawing on its established connections with artists, in 1993 Topps created a division of the company to publish comic books. Known as Topps Comics, its early efforts included several concepts from retired industry legend Jack Kirby, known collectively as the "Kirbyverse". Topps Comics particularly specialized in licensed titles with tie-ins to movies or television series, though it also published a few original series. Its longest-running and best-selling title was The X-Files, based on the Fox TV show. These comic books featured former Marvel Comics editor Jim Salicrup as its editor-in-chief. Some of the more famous titles included The X-Files, Lone Ranger and Tonto by Timothy Truman, Xena, Mars Attacks, and Zorro, which introduced the famous comics character Lady Rawhide. With sales stagnating, the company decided to pull out of the comics business in 1998. The Topps Pok�mon cards were purely for entertainment and collecting, but a new niche of collectible card games was also developing during this period (a Pok�mon trading card game was produced simultaneously by Wizards of the Coast). Topps made its first foray into the world of games in July 2003 by acquiring the game company WizKids for $28.4 million in cash. By inventing yet another niche, the constructible strategy game Pirates of the Spanish Main, this unit managed to reach profitability.